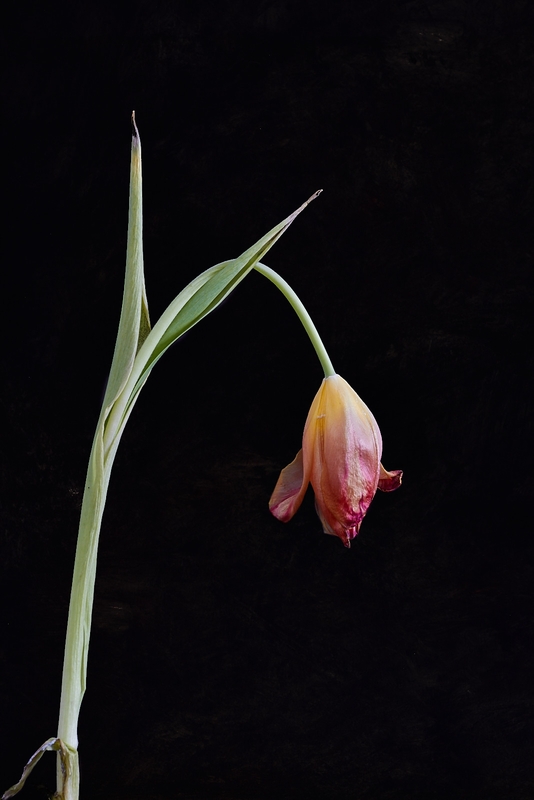 The Ageing Tulip is part of an ongoing project which started years ago. This project very much relates to another running theme: the celebration of everyday objects. Both themes are about how objects, plants in this case, are taken for granted or ever worse, considered ugly or unneeded. Maybe it is I worked in the flower fields in The Netherlands already at the age of eight years. Maybe it always has been part of me, maybe something else. But I always look at living or non living subjects through several lenses. I am aware of the contemporary “beauty lens” which is very much dictated through various forms of media. At the same time I see through the lens of marvel and wonder and enjoy for example the wonder of growth and engineering properties. The Ageing Tulip is very much about the beauty of the wrinkle and structure. Why is a smooth skin considered beautiful but a skin full of wrinkles not?